It's never too late to start your health kick.If you remember your teenage years, you can probably recall coming home from school, grabbing the biggest bowl in the kitchen and filling it up with your favourite cereal. A few hours later you'd be at the dining table wolfing down a big dinner -- all the while remaining lean.There's no doubt as we get older our metabolism begins to slow down. Those few weeks of indulging in delicious junk food begins to have more of an effect on our bodies, much to our dismay. 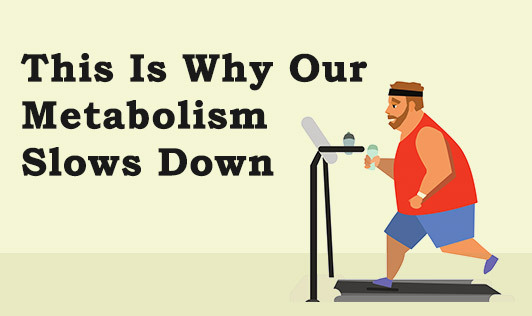 Why does our metabolism slow down, and is there anything we can do to prevent it? "Your metabolism refers to the chemical and physical processes that occur continuously inside the body, which keeps us functioning normally in order to stay alive. These processes include breathing, nerve function and blood circulation, as well as the breakdown of nutrients from food and drink that is then converted to energy. The largest component of your metabolism is your basal metabolic rate (BMR), which is the amount of energy your body uses just to maintain functioning at rest. This surprisingly accounts for 50-70 percent of the energy used each day. "It is thought that your BMR decreases at one to two percent per decade after you reach the age of 20 and up to 10 percent per decade after the age of 45. The reason why our metabolisms are faster when we're young is due to our increased energy needs and reduced fat mass. When we are young, we are still growing and developing. This process requires a lot of energy and, in turn, the body requires a lot more energy from food and beverages to support this process. Another reason why our metabolism is faster when we are younger is that we are generally more active and have less fat mass compared to when we age. As we get older, our metabolic rate generally slows because the aging process results in a decrease in muscle mass and an increase in the amount of fat stored. It is thought that your BMR decreases at one to two percent per decade after you reach the age of 20 and up to 10 percent per decade after the age of 45.Staying active can help optimize your metabolism. There are also several hormonal and neurological changes that take place, which will also influence levels of stored fat. But is there anything we can do to prevent our metabolisms from slowing down? Unfortunately, we cannot defy the process of aging so our metabolism will decline naturally as we age. However, there are some steps we can take now to optimize our metabolism. To increase your metabolism through physical activity, any form of cardiovascular exercise is good. High-intensity interval training (HIIT) can be particularly effective, due to the concept of 'after-burn' -- that is, an increase in resting metabolic rate that occurs for up to 24 hours post-exercise. Weight/resistance training to build lean muscle mass is also important for optimal metabolism as muscle is more metabolically active than fat mass. Time to hit the weights: Your basal metabolic rate is partly determined by the amount of muscle you have because muscle burns a lot more calories compared to fat, so when you lose muscle, your metabolic rate drops and you burn fewer calories. This would suggest that the more muscle you have, the higher your metabolic rate. If you get too little sleep, your metabolism slows down to conserve energy, which then triggers the release of the stress hormone cortisol.Having consistent high levels of cortisol increases fat cell growth and storage because visceral fat tissue contains a high number of cortisol receptors which respond to the circulating cortisol in the blood. As a result, this can negatively affect our metabolism. Slotting in time for yourself can also help reduce stress levels. Low levels of vitamin D result in your body producing certain hormones that are responsible for fat cells to hoard and store fat rather than burn it. Fatty fish, such as salmon, are a good source of vitamin D. Magnesium is a co-factor of many enzymes involved in glucose metabolism. It has an important role in the action of insulin, and insulin stimulates magnesium uptake in insulin-sensitive tissues.Therefore, people with lower levels of magnesium may be at higher risk of insulin resistance, which causes fat to accumulate around the abdomen. Metabolism is controlled by the thyroid gland in the neck, which in turn is governed by a part of the brain called the hypothalamus. Slowing metabolism is part of the aging process, but there are steps we can take to help.The speed of your metabolism depends on complex chemical messages, which are sent to your brain by your body, telling it how much it needs to function optimally. If there is an imbalance with your thyroid hormones, this may slow your metabolism down, so it may be beneficial to get your thyroid hormones tested to make sure they are within optimal ranges. Although, ultimately, we cannot stop aging and our metabolism slowing down, there are some other foods and dietary tips that may help boost your metabolism. Avoid fad diets -- these usually are very low or too low in total calories and eliminate certain food groups, which may place you at risk of nutrient deficiencies. Pump up the protein -- your body digests protein more slowly than fat or carbohydrates, which makes you feel fuller for longer. A sufficient protein intake will also assist in building and preserve lean muscle mass. Add spices to your food, for example, chilli and cayenne pepper. Avoid trans fats -- these fats bind to fat and liver cells, which may slow metabolism and increase inflammation in the body. Drink green tea -- the active ingredient, catechin, found in green tea may boost your metabolism.